Sea World Parks is a leading theme and entertainment parks company that has a slew of underwater parks all over the US. These parks that witnesses million of footfalls all around the year combine education with entertainment for children. All their theme parks offer a variety of educational resources and programs for parents, children and teachers that include protection, wildlife rescue and education. 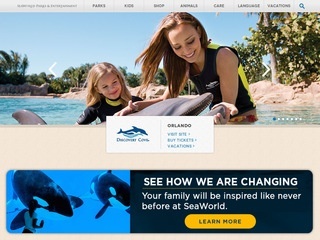 Sea World Parks are the caretakers of one of the largest zoological collection across the continent of North America.